Res Ipsa Knit With Her: I'm si chanceux! That's "I'm so lucky" in French. Yesterday a package came in the mail from my friend Jennifer. It smelled absolutely amazing before I even opened it. There was a sachet of lavender inside and with the heat wave we are having it really brought out the smell. It was fabulous. I just wanted to sit there and sniff the package. But I had to rip it open to see what was inside. You see Jen just came back from Paris and she is so sweet she sent me 3 skeins of this gorgeous yarn! What a special treat. THANK YOU JENNIFER!!! 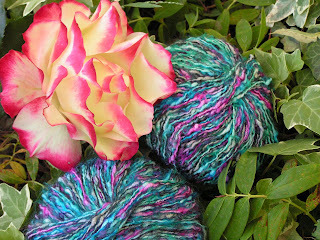 The yarn is blue and pink and purple and is it so gorgeous. It is thick and thin and fairly soft. She doesn't know what kind it is (there is no label) but there appears to be enough for a scarf so now I just have to find the right pattern. Any suggestions? Maybe I should go to Paris and see what the Parisian women are wearing these days - what do you think? It is so exciting to get a fabulous package and now have this wonderful yarn all the way from Paris. I am indeed a lucky girl. Very Fun! I also received a lavender infused yarn filled package from our world traveling friend!! Isn't it wonderful? Your yarn will be a beautiful scarf! You are a very lucky girl! And a generous soul too. I got the package. Thank you so much. Yes...I can see you sent blue skies. I just tagged you...check my blog. I hope today is a good one for you.